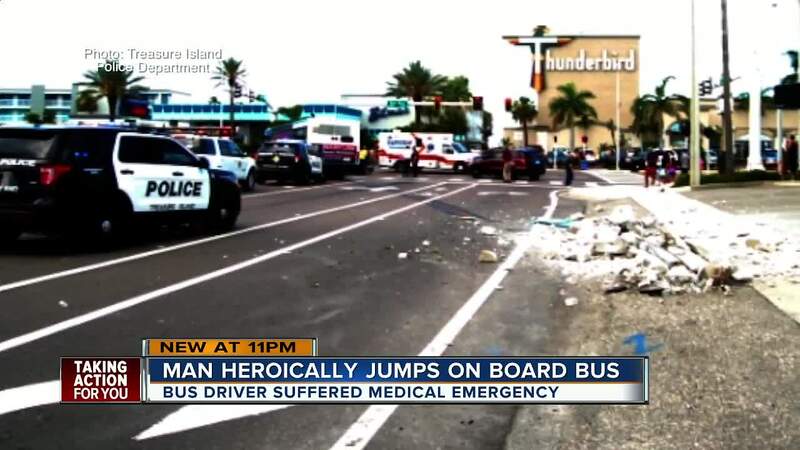 TREASURE ISLAND, Fla. — A Pinellas County man jumped onto a moving bus to save a bus driver who was having a medical emergency. Video shows the bus first zooming past on the sidewalk. Later, you can see part of a concrete pole go down as the bus is heading toward oncoming traffic before a good Samaritan turned the wheel and corrected the bus. 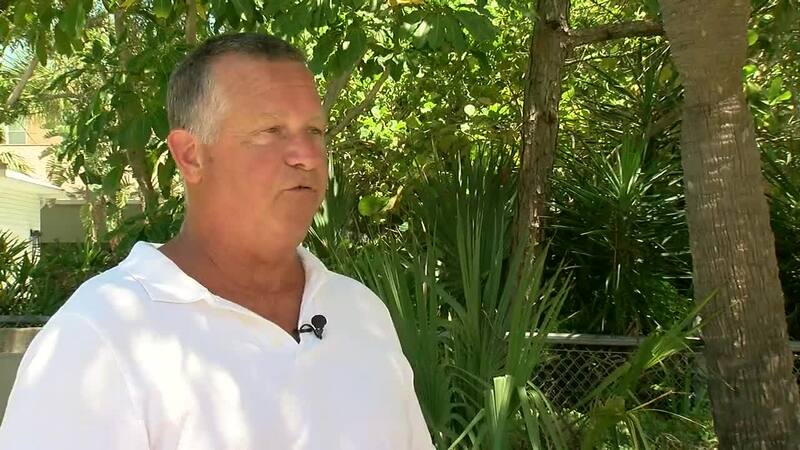 "I could tell there was a problem because I followed him for a mile," said Mike Hale. Mike Hale said he saw the bus hop curbs and swerve on busy streets. He dialed 911 as he inched closer to the bus and followed it. 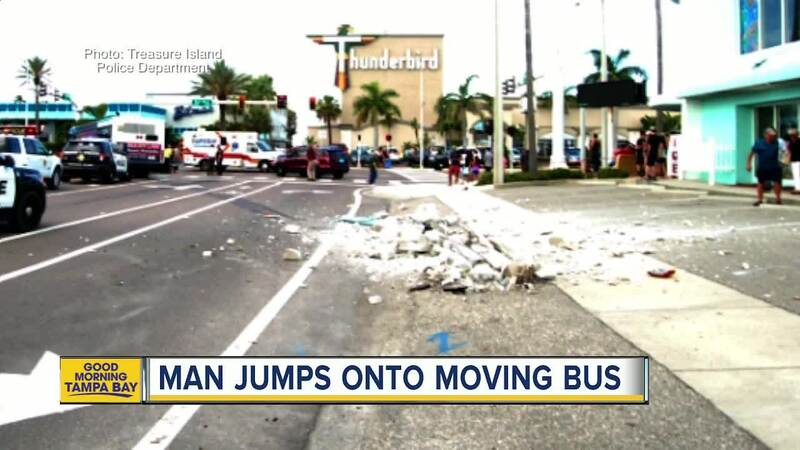 He was able to get the bus driver's attention. "He was talking, but didn't make any sense," said Hale. The scary situation unfolded around 10:30 Wednesday morning. Treasure Island was packed with people driving or walking. "It wasn't until that young lady said I think he's having a seizure that's when I jumped on the bus," said Hale. No one else was on board the bus. Hale had parked his car at a nearby bank and jumped onto the moving bus. The driver was unresponsive by the time Hale was there. "There was no keys, no red stop button! I had not been on a bus in 40 years!" said Hale. 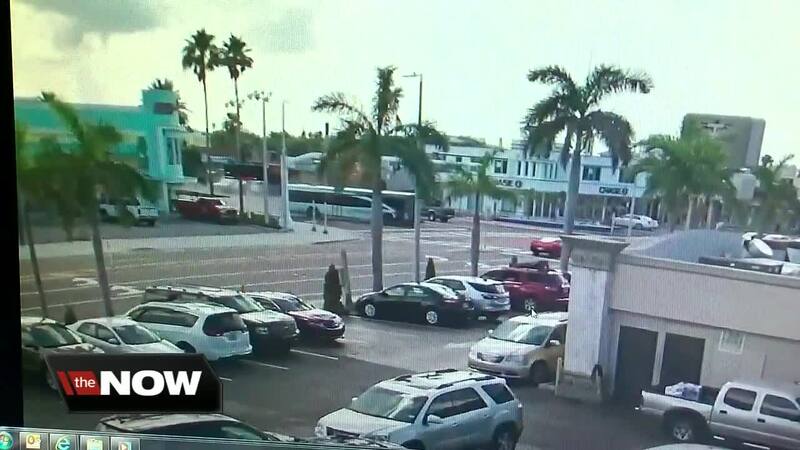 The bus accelerated before Hale crashed into a concrete pole on Treasure Island Causeway. He was able to avoid pedestrians walking and other vehicles. "A huge concrete pole and it was pummeled. It looked like a bomb went off. It was broken into so many tiny pieces," said Rene Kesig, an employee at Lana's Downtown Lounge. The bus driver remains in a hospital. His family requested privacy. We were unable to get an update on his condition or learn more about his medical emergency. Officials with Pinellas Suncoast Transit Authority (PSTA) said he has worked for them for 17 years.